Read more about Crash retrieving video folders? Fix is on the way! Some folk using the iOS version of PocketWGU have seen a return of the "Missing Course Data" issue we noted back in November. The good news is that this is fixed in relase 1.7.8 (available now!). It's a bit tricky to explain, but the short version is that if WGU has migrated your account to the latest version of the portal "backend", and you've chosen to stick with, or switch back to, the "Classic" portal interface, then you'll need to upgrade to 1.7.8 to see your course data. The "Classic" portal interface is the one that has a mostly white background and a blue menu bar. There was a bug in older PocketWGU versions that only worked with the new interface for students with the new backend, that's now been fixed. Sorry for the inconvenience. Read more about PocketWGU for Windows Phone? Howdy all, and Merry Christmas! We've noted that something odd is happening with some of the video links within Course of Study (CoS) pages. For some reason, the WGU systems are embedding video links (YouTube and Panopto) with URLs that include the "httpss://" protocol specifier. This is obviously a mistake (there should only be one "s"), but it is breaking many of the video links in PocketWGU. Either the video won't appear, or in some cases, clicking on the video link causes PocketWGU to crash. We have already fixed this for the next releases on both iOS and Android. These new releases should be out soon. In fact, we have some other nice goodies planned for those releases as well, so stay tuned! There's quite a bit that's new in the latest release of PocketWGU for iOS. For starters, the entire UI has now been modified to fit within the iOS 7 style (while still supporting iOS 6 & 5). The CoS view now displays content in a larger, easier to read font with a cleaner table of contents. The new main menu makes it easy to check for unread email (without logging into webmail), to contact your mentor, and to get help or send feedback to the PocketWGU DevTeam (that's us!0. 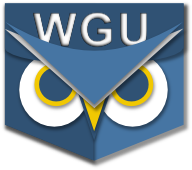 We've re-vamped the "WGU Direct" section to make it cleaner too, and to add new content including direct links to nearly every social media network on which WGU is active. We hope you like it! Read more about Missing your course data? So, it seems there are a few active iOS users out there. The latest PocketWGU version (1.7.0) went live on the App Store last night at about 5pm (EDT) and by the end of evening over 2,000 people had already ugraded. That's 20% of 10,000+ who have tried the app in its 2+ years of existence, all upgrading in a few hours after release. Our experience has been that users upgrade to the latest releases of PocketWGU pretty quickly, with about 75% adoption of the latest version within a month of release, but 2k users in one night is still pretty high. Thanks! As for what's new in 1.7.0, users on iOS 5 and 6 should only see a few minor changes to the UI. These were done to make the code easier to support on Apple's upcoming release of iOS 7 (due this weekend). The DevTeam has tested 1.7.0 extensively with the v7 "GM" release and things seem to work, let us know what we missed. The new look of v7 is quite different (translucent and flat), so we still need to make some further UI improvements over the coming months, but we wanted to be sure that the app at least worked when the new OS came out.